Hello Friends, I hope you have had a great week! I have another free-to-use pattern to share with you today. 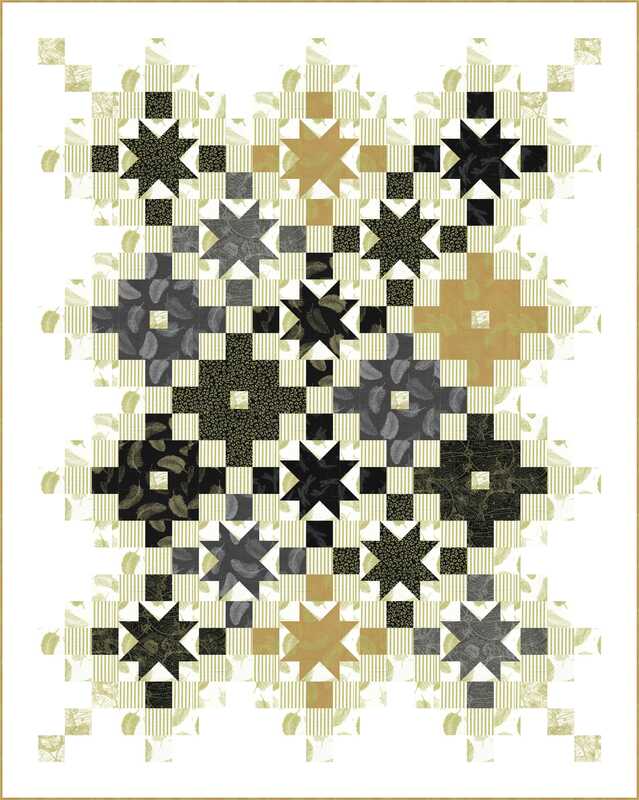 It is my Shimmering Constellations, designed with Benartex’s Gold Standard fabric line. The image above simply does NOT do the fabrics justice. You really have to see these metallic fabrics in person. They don’t just make great quilting fabrics. I think they also make beautiful home dec fabrics as well! A big thank you to my lovely quilting elves (Sherry of Indiana, and Darlene of Sew Graceful Quilting) who graciously helped out by making the sample, I have an upcoming editorial feature with these amazing fabrics! I like to make my own samples whenever I can, but when I can’t, Sherry is the only one who pieces my tops, and Darlene is the one who quilts them. Stay tuned for details of the editorial feature — it is breathtaking! You will also start to see the other samples Sherry and Darlene have made for me popping up in the near future. These two dear ladies allow me to sleep better when I do go to sleep, ha (! ), but seriously, I know I leave my samples in good hands when they work on them. 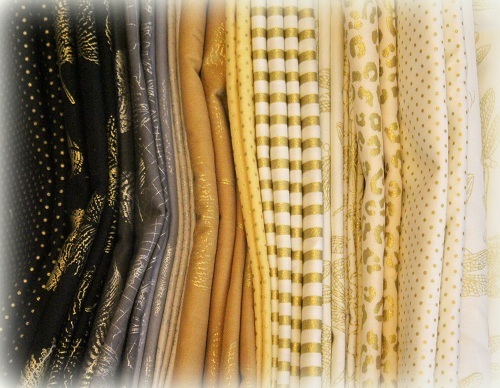 Click here to view the Gold Standard fabric range. Thank you for stopping by! Have a lovely rest of the week. My busy week just got more complicated — so, I need to get going for now! Hugs to you all. Oh, and don’t forget to see if you couldn’t view these fabrics in person at your local quilt shops! This entry was posted in Quilt Pattern, Quilting, Quilts: Pieced and tagged Benartex Gold Standard, Free Quilt Pattern, Free Star Quilt Pattern, Metallic Fabrics, Wendy Sheppard Designs. Bookmark the permalink. All of your designs are stunning, but this one truly inspires me. I love the design and while I love stars, this one just pulls in so much more visual impact. And, the fabrics are gorgeous. 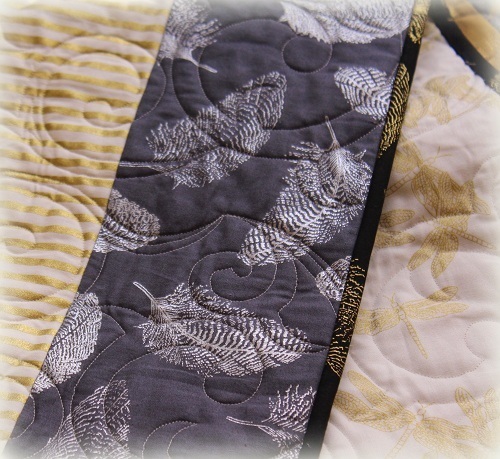 Love the blend in this quilt, but the dragonfly print definitely captures my interest. Total #CreativeGoodness. Thank you so very much for another wonderful free pattern. PS – I’m so happy to hear you have some quilt Angels that are so talented and able to help you keep up with all your amazing ideas. Thanks…got it this time!!! I love it!! Oh, I wish I had a little elf to do my quilting!! Anyone know where you can buy them???? Lovely pattern. Speaks “traditional” with a modern twist. While these fabrics are beautiful, I think that I would like to see it stitched in calico-type fabrics. Happy that you have a couple of “Guardian Angels” to lighten your load. Thanks for your continued inspiration and your wonderful free patterns. This is just beautiful! Those shimmering fabrics are gorgeous. What a wonderful quilt pattern to showcase those fabrics. Thanks so much. Oh Wendy!!! Your stars make my heart go pitter-pat!! I do believe this is my favorite of all your designs ever. Thanks so much for sharing…this one will definitely be on my “to-make” list !